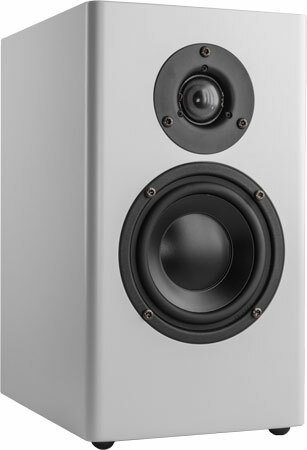 Hadera is a two-way bassreflex bookshelf speaker with drivers of high quality from Morel. This woofer is a good choice for small enclosures. In the high range is working the Morel CAT 408. It employs a tweeter Morel CAT 408 and a woofer Morel CAW 428. The crossover consists of a second order high-pass filter (12 dB per octave slope) for the tweeter. A bypass capacitor extends the frequency response above 10 kHz. The woofer is connected to a 2nd order low-pass filter with a series resonance circuit to smooth the frequency response curve. Between 70 Hz and 22000 Hz, the frequency response is nearly ideal. Apart from some weak resonances the decay spectrum is nearly perfect. At low volume, i.e. 85 dB at 1 m, the nonlinear distortions are lower than 0.4% above 400 Hz and stays below 1% at 95 dB at 1 m .
The high-end kit is delivered with baked varnish air coils (except in parallel to the woofer) for minimizing microphonic effects. - The current flow through the coil creates a magnetic field which sets the reel of wire in motion. This motion induces a voltage in the coil which adds itself to the signal. The stiffer the reel of wire is, the less the signal will be altered. All capacitors are of type MKP (polypropylen) and in series to the tweeter ClarityCaps of type ESA 250 V are employed.